Sometimes a simple design is the best. The Inspiration white with white lace border plastic plates for weddings has a clean look that goes great with a variety of color combinations. The plates are sturdy and once you're done you can just throw them away. You won't find a better looking plastic dinnerware set at a better price. A Party Source is your one-stop shop for wedding and special occasion cutlery and dinnerware. We have numerous designs for disposable plates for weddings and many other items for your special occasions. Inspiration 10 1/4" White w/ White Lace Border Banquet Plastic Plates 10ct. 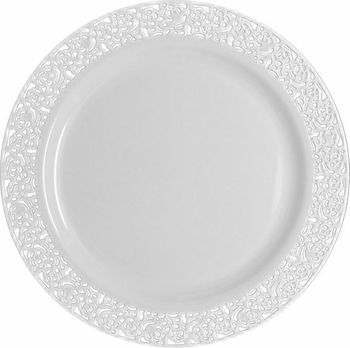 Inspiration 9" White w/ White Lace Border Luncheon Plastic Plates 10ct. Inspiration 7" White w/ White Lace Border Salad / Cake Plastic Plates 10ct.